What are your breakfast plans in your emergency kits? I might be fine with a granola bar or something quick, but my husband would rather have something real. Something hot. Like eggs and bacon. Maybe hash browns. If you’re looking for something a bit more substantial and more like regular breakfast to add to your emergency breakfast supplies, check out the freeze dried breakfast choices from Mountain House. To make it super easy, they have put together a Just in Case bucket with an assortment of sixteen breakfasts. And even better, we’re hosting a giveaway for one of these fantastic buckets! To see all the benefits of a bucket of Mountain House breakfasts (and see how the toddler likes the eggs and bacon), watch the video below. If the video does not show up for you, watch it here. No, I don’t believe your entire food storage plan should consist of freeze dried meals. Yes, they have their place, and I have some of these same meals in my emergency kits. They are also a quick and easy breakfast for camping, hiking, and fishing trips! Now I know you want to win one of these Just in Case buckets for yourself and here’s how to do it. Do any or all of the entry choices to earn entries. There are five–like my page and Mountain House on Facebook, follow me and Mountain House on Pinterest, and share this contest. Easy, and each one you do earns you an extra entry in the giveaway. This giveaway will run through Tuesday, January 21, 2014 at midnight mountain time. Winner has 48 hours to respond to the notification email before a new winner will be chosen. Good luck! Every day I learn something new about being prepared. Thanks for your help! For Christmas my son got me a mountain house bucket of meals. He knows me well! This would be a treat to try. We just tried Mountain House for our camping trip last weekend. We loved the eggs and bacon. Everyone else was jealous! Mountain House products have never disappointed. The thing to remember about this “bucket” – this is NOT a long-term storage item. The pouches only have an approximately 5-year shelf life. The food from Mountain House (Oregon Freeze-Dry) is always good, and I thank you for letting me know about the “Breakfast Skillet” an apparently NEW breakfast item. The cans are MUCH better for long term (30 ears PLUS)…but the packets are more for mobile situations. I myself have used them for well over 30 years with Boy Scout hikes, camps and activities. The Mountain House eggs and bacon are fantastic, my family loves them! I want to thank you for helping me prepare my prepare for survival. I would like to say that I am not only preparing my B-bag but I am also preparing my body. It will end up survival of the fittest. 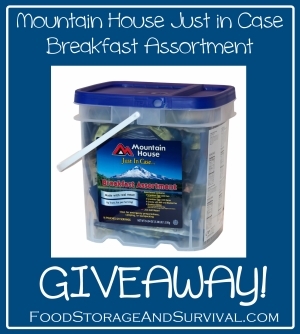 Would love to try Mountain House and since breakfast really is one of the most important meals of the day, what a great giveaway. I am excited to have a chance to win this bucket of food. Thanks. Great supplies for a power outage. OMG This would so awesome to have! Pick me, PLEASE? Love Mountain House ! Would love to win this! With a family of 7, it’s hard to make sure we have enough food storage. This would really help! Good luck to all! This would be so awesome. I’m just starting my food storage/survival. Nice giveaway. Have been wanting to try their stuff for awhile . This would be great to have on hand for emergancies and for back packing. Great giveaway! Would LOVE to have this. Thanks for the offer. Would love to be able to win this and to try for my family. 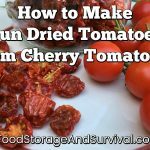 Love survival prepping and homesteading! This would be great to win! We are lacking breakfast foods in our food storage so this would really be a big help and a blessing. Mountain House foods are the best ones of tried.